The Pakistan-India Peoples’ Forum for Peace and Democracy (India Chapter), a non-government body working for the promotion of people-to-people contact between the two countries, has welcomed the statement of Pakistan’s newly-elected Prime Minister Imran Khan that his government would "want to improve our relations with India". In a statement, its office bearers, human rights activist Tapa K Bose, ex-Planning Commission member Syeda Hameed (co-chairpersons), Vijayan MJ (general secretary) and Bhargavi Dilipkumar (executive secretary), said, they agree with Khan that it is pointless to indulge in "blame game that whatever goes wrong in Pakistan’s Baluchistan is because of India and vice versa". The statement says, this is significant particularly in the context that India and Pakistan relationship has "reached its all-time low to in recent years with no bilateral talks taking place", adding "Violations of the ceasefire agreement of 2003 between the two countries in the Jammu & Kashmir region, has caused immense sufferings to the residents of the border region in both the countries." Insisting that the two countries have systematically failed with to assess the causes of cease fire violations, sparking bilateral crises, the statement says, this has only gone to promote terrorist activities on both sides of the border. "We have also seen that the 2003 ceasefire agreement tends to hold when a dialogue process is underway", it says, insisting, "Indian government must engage with the newly elected Government of Pakistan to assure return to normalcy and positive engagement." It adds, "We believe a positive response will ease out the current negative visa and trade regime and will also save the miserable lives of hundreds of fishworkers and other prisoners, in each other’s prisons. An unconditional and open dialogue, is the way forward." The statement comes close on the heals of a top civil rights organization headed by well-known human rights defender Teesta Setalvad, Citizens of Justice and Peace (CJP), taking note of a Zee News programme on June 30, Kya Kehta Hai India, has lodged a complaint with the News Broadcasting Standards Authority (NBSA), stating that the programme has been seeking to call for widespread violence against the population of Jammu & Kashmir, even whipping up sentiments against Pakistan. 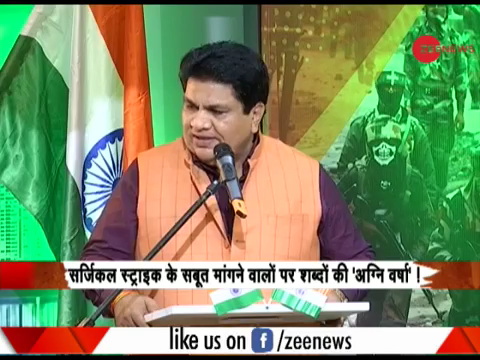 The statement points out how Dinesh Raghuvanshi, a poet, during the broadcast, said that soldiers will enter Pakistan’s houses and kill them there, through his poetry. He challenged Pakistan to fight India and free the Kashmir land it took over in 1948. He added that all the people who are against the Indian army in Kashmir, those people will not just be taped to the bonnet of the car, but all four sides. He questioned Kashmiris and asked if they have any respect for the country. The poet's reference was to a Kashmiri shawl weaver who voted in the elections for India was tied to an army jeep with a piece of paper stuck to him which said ‘this is the fate of the stone-pelter.’ The army had tied him as a human shield as a message against stone-pelters in Kashmir. Dr Anamika, another poet, that Kashmir breeds traitors who betray the country and bombs are grown in containers that store the saffron spice. “Remove Section 370[i] and enter every Kashmiri house. Whoever doesn’t hoist the Indian flags, let the heads of those traitors roll,” she adds. Noting what it considers to be growing hatred in the country, along with Zee News’ reported 150 million viewers and massive reach, CJP wrote to the Zee Media Corporation on July 9, seeking an appropriate apology to the Indian public from the channel, “for carrying such irresponsible, inciteful and violence inducing content” and breaching basic media ethics and principles. Failing to get a response from the Zee Media Corporation, CJP decided to file a complaint regarding the programme with the News Broadcasting Standards Authority (NBSA), which has been established by the News Broadcasters Association (NBA). In its letter, CJP said that Zee News had violated NBSA code of conduct, explaining that the content the channel broadcasted “encouraged and promoted violence against a particular community, thus endangering national security”.